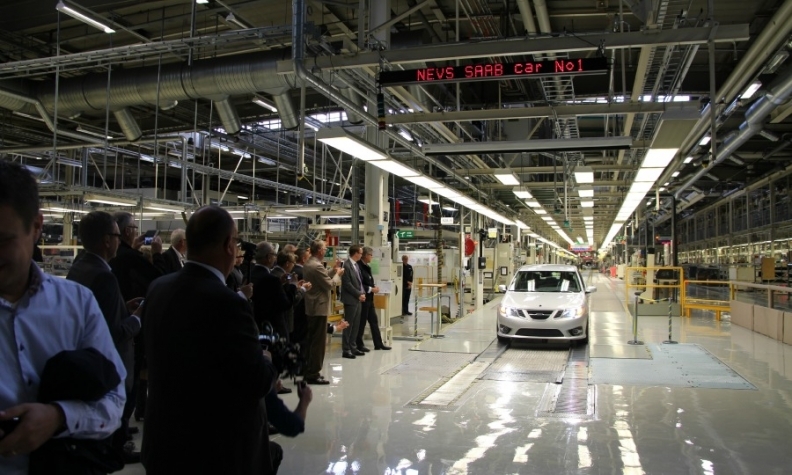 NEVS' first Saab 9-3 car left the Swedish assembly line in September 2013. Since production was halted in May of this year, no further cars have been built. Saab's owner, National Electric Vehicle Sweden (NEVS), says it is in discussions with potential partners as it seeks to restart car production and develop future models. NEVS was forced to stop production at Saab's factory in Sweden in May due to a shortage of cash to pay suppliers. NEVS last week denied that Saab is facing insolvency after a supplier filed a bankruptcy petition. "We need cooperation to secure a long-term financial structure and help us to solve our short-term financial challenges," a NEVS spokesman told Automotive News Europe. The spokesman said NEVS is talking with potential investors but declined to name them. Getting new investment is a "prerequisite to forming a decision on how and when we can resume production," he said. NEVS said Labo Test, one of Saab's suppliers, had petitioned a Swedish court to declare the automaker bankrupt over unpaid bills of 150,000 kronor (16,372 euros). According to NEVS, the petition has now been withdrawn. "The company does not have enough liquid cash today to pay all outstanding debt, but NEVS' assets are larger than its debt. NEVS cannot say exactly when, but NEVS' suppliers will get paid," the company said in a statement. The automaker’s debts amount to 3.6 million kronor (393,000 euros) with the Swedish Enforcement Authority, the Wall Street Journal reported Aug. 13, adding that the government agency has said another 91 claims, many of which are for several million kronor each, are waiting in the pipeline for NEVS to acknowledge. NEVS, which is controlled by National Modern Energy Holdings Ltd., whose founder and principal owner is Chinese-Swedish businessman Kai Johan Jiang, bought Saab from Dutch niche sports-car maker Spyker in September 2012 with the aim of reviving the brand with an electric lineup aimed chiefly at the Chinese market. Production of a gasoline-powered 9-3 model began a year later, but by May the company ran into financial difficulties and halted production, which stood at six cars a day. Spyker bought Saab from General Motors in early 2010, but soon hit financing problems and spent months trying to put together deals with Chinese companies before Saab filed for bankruptcy in December 2011.